For some of us, the ideas about God that we held onto for many years no longer make sense. Others may never have had any ideas about who or what God is. Some are exploring God for the first time. Maybe faith used to be an important part of your life, but something happened – something rocked you and sent you into a tail spin. Perhaps you think it’s easier to believe nothing at all than to become intolerant and judgmental like the people who rage against the LGBTQ community or protest soldiers funerals. Perhaps, more than anything else that could be said right now, it is important to know that you are not alone. Not in the there’s a heavenly being watching over you sense, but in the you’re part of a long history of searching sense. For thousands of years, humanity has wrestled with ideas of meaning and purpose and what living is all about. There are a lot of us. You don’t always see us because traditional views of faith dominate the conversation. But, we go to churches. We read scripture even though the cut and dried answers no longer satisfy our hunger for deep spiritual connection. Like you, we have surrendered to the flow, joining the millions of explorers that have gone before us. Jews, Christians, Muslims, Buddhists, Agnostics. All of us, in some way, are searching, no longer content to take things at face value. Like Richard Rohr, we believe that literalism is the lowest form of meaning. We’re reaching for something more. We believe that science and faith are mutually informed both help us to understand the world. We believe that the Bible is a beautiful story written by real people intending to make a point rather than create a text book. We wonder if Jesus was really born to a virgin or rose from the dead. We see beauty and meaning in all religious expressions. We affirm all of the varied and beautifully diverse forms that represent humanity. We don’t know what God is be we believe that it is good. In a culture dominated by traditional Christian views, thoughts like ours can feel isolating. There are few communities that would seem to welcome us in our doubt and our questioning. They might even call us heretics. But for thousands of years, humankind has been participating in these very conversations. The idea that we could prove God existed in exactly the way we believe is a relatively new development in our human history. A sense of certainty calms our fears when we convince ourselves that we can know God and how God is going to judge humanity at the end of the world. For the certainty we think we receive, we seem to lose our sense of wonder. To take away wonder – to answer these questions about God – is to take away some sense of awe. Facts cause us to feel settled and safe. Wonder is the kind of thing that compels us towards mystery. Wonder is what makes it all worthwhile. So, you are not alone. You never were. You are part of a community of people pursuing something wondrous. Maybe, what feels like doubt is the first steps towards the most compelling mystery we have ever known. Maybe the loneliness we feel is a longing to be connected to something deeply meaningful. Maybe in letting go of who we thought God was will give us the space for all that God might be. Spend a few moments reflecting on who or what you think God is. Try to form a mental picture of what that is. Maybe there are stories from the Bible or some other sacred text that inform this. Maybe there are things that you learned from childhood that never really seemed to make sense. Maybe there is nothing and you simply imagine black, empty space. Whatever it is, spend some time just sitting with these ideas. Let them reverberate in your mind. After a few moments, imagine those mental representations slip away into nothingness. Whatever you believe about God, starting this journey requires an ability to sit with an open mind, to be content with conflict and discrepancy, to be comfortable with uncertainty. Speak a few words of gratitude for the views of God that you have been able to hold over the years, for being able to let these go, and for the space to invite new ideas in. 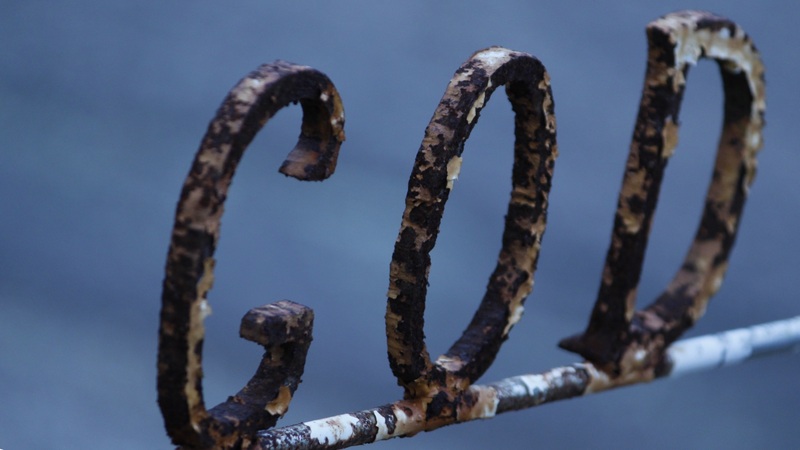 Looking for more resources to help you rethink what God is? Check out The Deconstructionist Toolbox.